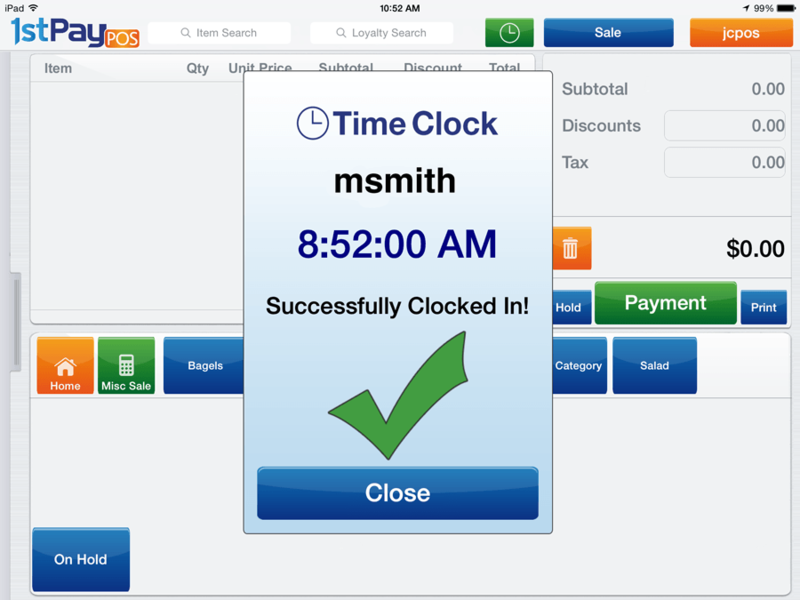 There is an Employee Time Clock service built into 1stPayPOS. This can be accessed from the login screen and main sale screen of the app. The merchant may also edit employee hours in the POS Portal, see here for more information on editing hours. From the Login Screen, tap the Time Clock button. Type in the PIN created for that user by the manager. After typing in the PIN, the screen will give you the option to Clock In or Clock Out, depending on whether you are currently clocked in or not. After Clocking In or Clocking Out, it will show a successful entry, with a time stamp and a green checkmark. Within the app, tap the green Clock icon at the top, next to the Sale button.